Deflation is a persistent fall in some generally followed aggregate indicator of price movements, such as the consumer price index or the GDP deflator. Generally, a one-time fall in the price level does not constitute a deflation. Instead, one has to see continuously falling prices for well over a year before concluding that the economy suffers from deflation. How long the fall has to continue before the public and policy makers conclude that the phenomenon is reflected in expectations of future price developments is open to question. For example, in Japan, which has the distinction of experiencing the longest post World War II period of deflation, it took several years for deflationary expectations to emerge. Most observers tend to focus on changes in consumer or producer prices since, as far as monetary policy is concerned, central banks are responsible for ensuring some form of price stability (usually defined as inflation rates of +3% or less in much of the industrial world). However, sustained decreases in asset prices, such as for stock market shares or housing, can also pose serious economic problems since, other things equal, such outcomes imply lower wealth and, in turn, reduced consumption spending. While the connection between goods price and asset price inflation or deflation remains a contentious one in the economics profession, policy makers are undoubtedly worried about the existence of a link, as Alan Greenspan’s “irrational exuberance” remark of 1996 illustrates. Until 2002, prospects for a deflation outside Japan remained unlikely. Prior to that time, deflation had been a phenomenon primarily of the 1930s and inextricably linked with the Great Depression, especially in the United States. Most observers viewed Japan’s deflation as part of a general economic malaise stemming from a mix of bad policy choices, bad politics, and a banking industry insolvency problem that would simply not go away. However, by 2001, reports of falling US producer prices, a sluggish economy, and the spread of deflation beyond Japan to China, Taiwan, and Hong Kong, to name a few countries, eventually led policy makers at the US Federal Reserve Board to publicly express their determination at avoiding deflation (e.g. See IMF 2003, Borio and Filardo 2004). Governor Bernanke of the US Federal Reserve raised the issue of deflation in late 2002 when he argued that the US public ought not to be overly worried since the Fed was on top of the issue and, in any event, the US was not Japan. Nevertheless, he also stressed that “central banks must today try to avoid major changes in the inflation rate in either direction. In central bank speak, we now face “symmetric” inflation risks.”1 The risks Governor Bernanke was referring to stem from the fact that, now that low inflation rates have been achieved, the public has to maintain the belief that central banks will neither allow inflation to creep up nor permit the onset of deflation. Even the IMF began to worry about the likelihood of deflation, as reflected in a major report, released in mid-2003, that assessed the probability that deflation might become a global phenomenon. While the risk that deflation might catch on in the US was deemed fairly low, the threat of deflation in Germany, for example, was viewed as being much greater. It is evident from the foregoing illustrations that deflation has again emerged as public policy enemy number one in some circles. Most observers need only think back to the global depression of the 1930s, when the combination of a massive fall in output and the price level devastated the U.S. economy. While the Great Depression was a global phenomenon, actual output losses varied considerably from modest losses to the massive losses incurred by the U.S. economy. During the period 1928-1933 output fell by approximately 25% as did prices. Other countries, such as Canada and Germany, also suffered large output losses. Canada also experienced a fall in output of at least 25% over the same period while prices in 1933 were only about 78% of prices in 1928. In the case of Germany, the deflation rate over the same 1928-1933 period was similar to that experienced in Canada while output fell just over 20% in that time. No wonder analysts associate deflation with “ugly” economic consequences. Nevertheless, as shall see, there exist varieties of deflationary experiences. In any event, it needs to be underlined that the Great Depression period of the 1930s did not result in massive output losses worldwide. In particular, seminal analyses by Friedman and Schwartz (1982), and Meltzer (2003), concluded that the 1930s represented a deflationary episode driven by falling aggregate demand, compounded by poor policy choices by the leadership at the US Federal Reserve that was wedded at the time to a faulty ideology (a version of the ‘real bills’ doctrine2). Indeed, the competence of the interwar Fed has been the subject of considerable ongoing debate throughout the decades. Disagreements over the role of credit in deflation and concerns about how to reinvigorate the economy were, of course, also expressed in public at the time. Strikingly, the relationship between deflation and central bank policy was often entirely missing from the discussion, however. The prevailing ideology treated the occasional deflation as one that acted as a necessary spur for economic growth, a symptom of economic health, not one indicative of economic malaise. However, there were notable exceptions to the chorus of views favorable to deflation. Irving Fisher developed what is now referred to as the “debt-deflation” hypothesis. Falling prices increase the debt burden and adversely affect firms’ balance sheets. This was particularly true of the plight faced by farmers in many countries, including the United States, during the 1920s when falling agricultural prices combined with tight monetary policies sharply raised the costs of servicing existing debts. The same was true of the prices of raw materials. The Table below illustrates the rather precipitous drop in the price level of some key commodities in a single year. Source: Federal Reserve Bulletin, July 1924, p. 532. Hence, a deflation is a harbinger of a financial crisis with repercussions for the economy as a whole. Others, such as Keynes, also worried about the impact of deflation on aggregate demand in the economy, as individuals and firms postpone their purchases in the hopes of purchasing durable goods especially at lower future prices. He actually advocated a policy that is not too dissimilar to what we would refer to today as inflation targeting (e.g., see Burdekin and Siklos 2004, ch. 1). Unfortunately, the prevailing ideology was that deflation was a purgative of sorts, that is, the price to be paid for economic excesses during the boom years, and necessary to establish to conditions for economic recovery. The reason is that economic booms were believed to be associated with excessive inflation which had to be rooted out of the system. Hence, prices that rose too fast could only be cured if they returned to lower levels. So, are all deflations bad? Not necessarily. The United Kingdom experienced several years of falling prices in the 1870-1939. However, since the deflation was apparently largely anticipated (e.g., see Capie and Wood 2004) the deflation did not produce adverse economic consequences. Finally, an economy that experiences a surge of financial and technological innovations would effectively see rising aggregate supply that, with only modest growth in aggregate demand, would translate into lower prices over time. Indeed, estimates based on simple relationships suggest that the sometime calamitous effects that are thought to be associated with deflation can largely be explained by the rather unique event of the Great Depression of the 1930s (Burdekin and Siklos 2004, ch. 1). However, the other difficulty is that a deflation may at first appear to be supply driven until policy makers come to the realization that aggregate demand is the proximate cause. This seems to be the case of the modern-day episodes of deflation in Japan and China. What’s different about the prospects of a deflation today? First, and perhaps most obviously, we know considerably more than in the 1930s about the transmission mechanism of monetary policy decisions. Second, the prevailing economic ideology favors flexible exchange rates. Almost all of the countries that suffered from the Great Depression adhered to some form of fixed exchange rates, usually under the aegis of the Gold Standard. As a result, the transmission of deflation from one country to another was much stronger than under flexible exchange rate conditions. Third, policy makers have many more instruments of policy today than seventy years ago. Not only can monetary policy be more effective when correctly applied, but fiscal policy exists on a scale that was not possible during the 1930s. Nevertheless, fiscal policy, if misused, as has apparently been the case in Japan, can actually add to the difficulties of extricating an economy out of deflationary slump. There are similar worries about the US case as the anticipated surpluses have turned into large deficits for the foreseeable future. Likewise the fiscal rules adopted by the European Union severely hinder, even altogether prevent some would say, the scope for a stimulative fiscal policy. Fourth, policy-making institutions are both more open and accountable than in past decades. Central banks are autonomous and accountable and their efforts at making monetary policy more transparent to financial markets ought to reduce the likelihood of serious policy errors as these are considered to be powerful devices to enhance credibility. Nevertheless, in spite of the obvious differences between the situation today and the ones faced seven decades ago, some parallels remain. For example, until 2000, many policy makers, including the central bankers at the Fed, felt that the technological developments of the 1990s might lead to economic growth almost without end and, in this “new” era, the prospect of a bad deflation seemed the furthest thing on their minds. Similarly, the Bank of Japan was long convinced that their deflation was of the good variety. It has taken its policy makers a decade to recognize the seriousness of their situation. In Japan, the debate over the menu of needed reforms and policies to extricate the economy from its deflationary trap continues unabated. Worse still the recent Japanese experience raises the specter of Keynes’ famous liquidity trap (Krugman 1998), namely a state of affairs where lower interest rates are unable to stimulate investment or economic activity more generally. Hence, deflation, combined with expectations of falling prices, conspires to make the so-called ‘zero lower bound’ for nominal interest rates an increasingly binding one (see below). There are at least two other reasons to worry about the onset of a deflation with devastating economic consequences. Labor markets exhibit considerably less flexibility than several decades ago. Consequently, it is considerably more difficult for the necessary fall in nominal wages to match a drop in prices. Otherwise, real wages would actually rise in a deflation and this would produce even more slack in the labor market with the resulting increases in the unemployment rate contributing to further reduce aggregate demand, the exact opposite of what is needed. A second consideration is the ability of monetary policy to stimulate the economy when interest rates are close to zero. The so-called “zero lower bound” constraint for interest rates means that if the rate of deflation rises so do real interest rates further depressing aggregate demand. Therefore, while history need not repeat itself, the mistakes of the past need to be kept firmly in mind. As noted above, inflation has been an all too common occurrence since 1945. The table below shows that deflation has become a much less common feature of the macroeconomic landscape. One has to go back to the 1930s before encountering successive years of deflation.3 Indeed, for the countries listed below, the number of times prices fell year over year for two years or more is a relatively small number. Hence, deflation is a fairly unusual event. Notes: Data are from chapter 1, Richard C.K. Burdekin and Pierre L. Siklos, editors, Deflation: Current and Historical Perspectives, New York: Cambridge University Press, 2004. The numbers in parenthesis in the first column refer to the first year for which we have data. The second column gives the frequency of occurrences of deflation defined as two or more consecutive years with falling prices. The last column provides some illustrations of especially persistent declines in the price level, defined in terms of consumer prices. In italics, years with currency crises (CC) or banking crises (BC), are shown where data are available. The dates are from Michael D. Bordo, Barry Eichengreen, Daniela Klingebiel, and Maria Soledad Martinez-Peria, “Financial Crises: Lessons from the Last 120 Years,” Economic Policy, April 2001. Is There an Empirical Deflation-Recession Link? If that is indeed the case why has there been so much concern expressed over the possibility of renewed deflation? One reason is the mediocre economic performance that has been associated with the Japan’s deflation. Furthermore, the foregoing table makes clear that in a number of countries the 1930s deflation was associated with the Great Depression. Indeed, as the Table also indicates for countries where we have data, the Great Depression represented a combination of several crises, simultaneously financial and economic in nature. However, it is also clear that deflation need not always be associated either with a currency crisis or a banking crisis. Since the Great Depression was a singularly devastating event from an economic perspective, it is not entirely surprising that observers would associate deflation with depression. But is this necessarily so? After all, the era roughly from 1870 to 1890 was also a period of deflation in several countries and, as the figure below suggests, in the United States and elsewhere, deflation was accompanied by strong economic growth. It is what some economists might refer to as a “good” deflation since it occurred at a time of tremendous technological improvements (in transportation and communications especially). That is not to say, even under such circumstances, that opposition from some quarters over the effects of such developments was unheard of. Indeed, the deflation prompted some, most famously William Jennings Bryan in the United States, to run for office believing that the Gold Standard’s proclivity to create deflation was akin to crucifying “mankind upon a cross of gold.” In contrast, the Great Depression would be characterized as a “bad” or even “ugly” deflation since it is associated with a great deal of slack in the economy. Notes: The top figure plots the rate of CPI inflation for the periods 1875-79 and 1929-33 for the United States. The bottom figure is an estimate of the output gap for the U.S., that is, the difference between actual and potential real GDP. A negative number signifies actual real GDP is higher than potential real GDP and vice-versa when the output gap is positive. See Burdekin and Siklos (2004) for the details. The vertical line captures the gap in the data, as observations for 1880-1929 are not plotted. Whereas policy makers today speak of the need to avoid deflation their assessment is colored by the experience of the bad deflation of the 1930s, and its spread internationally, and the ongoing deflation in Japan. Hence, not only do policy makers worry about deflation proper they also worry about its spread on a global scale. If ideology can blind policymakers to introducing necessary reforms then the second lesson from history is that, once entrenched, expectations of deflation may be difficult to reverse. The occasional fall in aggregate prices is unlikely to significantly affect longer-term expectations of inflation. This is especially true if the monetary authority is independent from political control, and if the central bank is required to meet some kind of inflation objective. Indeed, many analysts have repeatedly suggested the need to introduce an inflation target for Japan. While the Japanese have responded by stating that inflation targeting alone is incapable of helping the economy escape from deflation, the Bank of Japan’s stubborn refusal to adopt such a monetary policy strategy signals an unwillingness to commit to a different monetary policy strategy. Hence, expectations are even more unlikely to be influenced by other policies ostensibly meant to reverse the course of Japanese prices. The Federal Reserve, of course, does not have a formal inflation target but has repeatedly stated that its policies are meant to control inflation within a 0-3% band. Whether formal versus informal inflation targets represent substantially different monetary policy strategies continues to be debated, though the growing popularity of this type of monetary policy strategy suggests that it greatly assists in anchoring expectations of inflation. Borio, Claudio, and Andrew Filardo. “Back to the Future? Assessing the Deflation Record.” Bank for International Settlements, March 2004. Burdekin, Richard C.K., and Pierre L. Siklos. “Fears of Deflation and Policy Responses Then and Now.” In Deflation: Current and Historical Perspectives, edited by Richard C.K. Burdekin and Pierre L. Siklos. New York: Cambridge: Cambridge University Press, 2004. Capie, Forrest, and Geoffrey Wood. “Price Change, Financial Stability, and the British Economy, 1870-1939.” In Deflation: Current and Historical Perspectives, edited by Richard C.K. Burdekin and Pierre L. Siklos. New York: Cambridge: Cambridge University Press, 2004. Friedman, Milton, and Anna J. Schwartz. Monetary Trends in the United States and the United Kingdom. Chicago: University of Chicago Press, 1982. Humphrey, Thomas M. “The Real Bills Doctrine.” Federal Reserve Bank of Richmond Economic Review 68, no. 5 (1982). International Monetary Fund. “Deflation: Determinants, Risks, and Policy Options “Findings of an Independent Task Force.” April 30, 2003. Krugman, Paul. “Its Baaaaack: Japan’s Slump and the Return of the Liquidity Trap.” Brookings Papers on Economic Activity 2 (1998): 137-205. Meltzer, Allan H. A History of the Federal Reserve. Chicago: Chicago University Press, 2003. J. Patrick Raines and Charles G. Leathers, Debt, Innovations, and Deflation: The Theories of Veblen, Fisher, Schumpeter, and Minsky. Cheltenham, UK: Edward Elgar, 2008. xiii + 191 pp. $100 (hardcover), ISBN: 978-1-84542-785-6. J. Patrick Raines and Charles G. Leathers have produced a remarkable book on a very timely subject, namely the interplay between debt, innovations, and deflation. The authors recognize that little is being said about the causes of deflationary pressure in today?s economy. Therefore, they set out to provide a fresh critical assessment of the deflation theories of Thorstein Veblen, Irving Fisher, Joseph Schumpeter, and Hyman Minsky in light of the growing concern about deflation in the early 2000s in the United States. For this purpose, the authors focus on three fundamental questions. First, Raines and Leathers determine the four economists? explanations of the causes of deflation and how those explanations relate to the historical context of their writings on deflation. Second, they establish the extent to which those four theories have common points and complementarities. Third, the authors lay out the analytical and policy lessons to be taken from this study to analyze the concerns about deflation in 2002-2003. The book is organized in six main sections in addition to the introduction and a concluding section. Chapter 2 underscores the importance of the research question that Raines and Leathers are undertaking in this book. The authors provide a very concise analytical overview of the emergence of deflation as a monetary policy issue in the 2003-2004 period. They argue that the 1940-2000 period was dominated by concerns over inflation. Raines and Leathers point out that Alan Greenspan, however, began referring to deflationary tendencies as early as 1998, initially as an academic issue, and later as a matter of concern to policymakers. His main conclusion was that deflation is a monetary phenomenon in the long run. The authors highlight that in the brief period of concern over disinflation and deflation, neither Greenspan nor Ben Bernanke addressed the causes of deflation but merely focused on its likelihood and its consequences. In chapter 3, Raines and Leathers review the mainstream theory of deflation based on the classical interpretation of the quantity theory of money. In addition to Fisher?s interpretation of the quantity theory, the authors assess the ?deflation? theories put forward by Adam Smith, John Stuart Mill, and Thomas Tooke. The chapter ends with an overview of the monetary theories of business cycles of R.G. Hawtrey and Friedrich von Hayek. Chapters 4, 5, 6, and 7 respectively dissect the theories of Veblen, Fisher, Schumpeter, and Minsky. These chapters are excellent stand-alone readings for an advanced undergraduate or a graduate course on the four economists in question. Their scholarship is succinctly laid out, and the literature is thoroughly and critically reviewed. The strength of these chapters is the historical contextualization of the deflation theories developed by Veblen, Fisher, Schumpeter, and Minsky. Chapter 8 is where the entire book comes together in a meaningful way. It provides a comparative summary of the analysis made in chapters 4 through 7. This is by far the most interesting chapter of the book. Here, Raines and Leathers identify two main categories accounting for the differences among the four economists. First, there are evolutionary changes in the institutional structure of the economy that must be accounted for; and second, there are differences in methodologies and normative perspectives that cannot be reconciled. Veblen and Schumpeter are identified as the two extremes on the spectrum of the book, despite sharing an evolutionary analysis of the role of technological innovation in the development of capitalism; what sets them apart is the way they treat business values and institutions. Fisher and Minsky are placed somewhat in between, with Fisher?s descriptive theory of deflation closer to Schumpeter; and Minsky?s financial instability hypothesis closer to Veblen?s evolutionary analysis. The authors conclude that when taking all four theories together, we could have a better understanding of the causes of deflation and be able to develop the appropriate policies to deal with it. This is especially important in an era in which (technological and financial) innovation and debt play an increasing role in the structure of the U.S. economy. The shortcomings of the book are mentioned here in the spirit of unsatisfied curiosity. First, the choice of Veblen, Fisher, Schumpeter, and Minsky remains somewhat unexplained. Why not Keynes or Marx? Second, the book is exclusively focused on the U.S. experience with deflation; one would have liked a discussion of Japan?s experience with deflation in the 1990s, for instance. Third, the focus on the Fed?s treatment of deflation seems to be the initial motivation for writing the book, but somehow it remains as an add-on theme, albeit an interesting one, that only appears in the beginning and at the very end of the book. This makes the thesis of the book a bit too broad, and suggests that there are perhaps two competing book ideas — one on the deflation theories of Veblen, Fisher, Schumpeter, and Minsky; and another on the Fed?s treatment of deflation concerns. In sum, the book is a valuable contribution to the literature on the causes of deflation, and how it has been treated by the Fed. Fadhel Kaboub is an Assistant Professor of Economics at Denison University, and a Research Associate at the Levy Economics Institute, the Center for Full Employment and Price Stability, and the International Economic Policy Institute. His research focuses on the political economy of full employment policies, monetary theory and policy, and economic development. Richard C.K. Burdekin and Pierre L. Siklos, editors, Deflation: Current and Historical Perspectives. Cambridge: Cambridge University Press, 2004. xxii + 359 pp. $75 (cloth), ISBN: 0-521-83799-5. With oil prices accelerating rapidly over the past year, housing prices “frothing” in coastal areas, and the Federal Reserve raising the federal funds rate twelve times since the end of the most recent recession, the timing of a new book addressing the topic of deflation seems somewhat inopportune. Nevertheless, it is worth remembering that, as little as two years ago, American policy makers were seriously pondering the possibility of deflation. Improvements in labor productivity and the expanding use of global supply chains to manage input costs were holding the lid on the overall price level, and short-term interest rates were approaching the zero bound in the wake of the 2001 recession and the collapse in spending on information technologies. Such circumstances warranted the consideration of the small-probability event of sustained deflation, given Alan Greenspan’s risk-management approach to central banking. Deflation and related issues such as asset price booms and busts, liquidity traps, and the operation of monetary policy in extremely low interest-rate environments consequently received renewed attention from domestic policymakers and economists. Moreover, policy debates over the effects of deflation and the appropriate response to it had been taking place for some time in other parts of the world. In particular, Japan was bearing witness to the first recorded deflation in an industrialized country since the Great Depression. These issues and policy debates form the backdrop for the edited volume by Richard Burdekin and Pierre Siklos, which offers a critical evaluation of historical episodes of deflation and some long-run perspective on more recent events. The edited conference volume consists of twelve chapters that examine deflation by drawing on theory, history, and empirical evidence. The book features interesting contributions by many eminent financial and economic historians. This alone would make it appealing to specialists working in macroeconomic history, but it ought to attract a broader readership, including macroeconomists, central bankers, and policymakers, since the editors were careful to include papers that employ more recent data and theory. Indeed, one of the strengths of the volume is that the contributors employ a variety of methodological perspectives to analyze monetary phenomena and compare present issues with past episodes of deflation. After an introductory chapter that provides a useful summary by the editors, the book is divided into four sections. The first part of the book, entitled “Fears of Deflation and the Role of Monetary Policy,” begins with an essay by Hugh Rockoff. He suggests that the U.S. bank failures of the 1930s exhibit characteristics that are similar to twin crises (banking and exchange rate crises) that have occurred more recently in national economies. Rural regions in the U.S. experienced “capital flight” because depositors feared that declining export prices and demand would undermine the ability of borrowers to repay; this eventually prompted runs on some banks and led authorities to impose restrictions on withdrawals (bank holidays). Rockoff contributes to the growing literature on regional differences in bank performance during the Great Depression by focusing on “silent runs” — the withdrawal of deposits from rural areas and their movement to Eastern financial centers — a process that was driven in part by declining prices and deflation. The interregional evidence is consistent with his argument, although individual bank data showing that losses of deposits had important consequences for the survival of banks would further strengthen his argument. In the second chapter of this section, Forrest Capie and Geoffrey Wood take a longer-run perspective and examine whether debt-deflation had damaging effects on the British economy between 1870 and the 1930s. J.M. Keynes’ views on debt deflation suggested that expected real rates are important for generating real effects, whereas Fisher emphasized that rising realized rates produced dilatory effects on existing debtors. The authors use simple time-series analysis to produce price-expectation series and then construct real interest rates that take into account either expected inflation or actual inflation, according to the respective ideas of Keynes and Fisher. They use these series as well as bond spreads to assess the effects of debt deflation, and find little statistical evidence that debt-deflation in Britain created adverse effects for the real economy (or for financial stability). The authors rightly point out, however, that Britain’s experience with deflation was much milder than that which occurred in the U.S., so it is difficult to rule out the debt-deflation hypothesis in general. Klas Fregert and Lars Jonung close out the first section of the book by examining two cases of interwar deflation in Sweden, 1921-23 and 1931-33. They use the relatively short interval of time between these two episodes to assess how policymaking and macroeconomic outcomes in the first episode were influenced by the inflationary period of World War I, and how this deflationary episode (and the persistent and high unemployment that emerged in the 1920s) in turn influenced beliefs and behavior ten years later. Fregert and Jonung employ qualitative evidence to argue that the large deflation in the early 1920s greatly influenced the thinking of economists, policymakers, and wage setters in the latter episode. Heterogeneous expectations across these groups limited the deflation of 1931-33 as wage contracts were shortened and, in some cases, abandoned. The second section of the book, entitled “Deflation and Asset Prices,” provides new contributions to the growing literature examining the relationship between monetary policy and asset prices. The first, by Michael Bordo and Olivier Jeanne, develops a model to assess whether monetary policymakers should respond to an asset price “boom” — a term which, according to the authors, differs from a “bubble” in that it is not necessary for policymakers to determine if asset prices reflect fundamentals in order to act. If monetary policies decide not to lean against the wind, they run the risk of a boom being followed by a bust, and a collateral-induced credit crunch dampening the real economy. On the other hand, pursuing restrictive monetary policy implies immediate costs in terms of lower output and inflation. Although the model is very stylized, they find that a proactive monetary policy is optimal when the risk of a bust is large and the monetary authorities can let the air out at a low cost; moreover, they argue that such a policy rule will not look like a Taylor rule in that it will depend on the risks in the balance sheets of the private sector. They then present some preliminary empirical evidence that the boom-bust cycles of their model appear to be much more frequent in real property prices than in stock prices and more common in small countries than in large. (The obvious exceptions to this are Japan’s experience in the 1990s and the U.S. during the Great Depression.) Moreover, they suggest that such busts can create banking crises and lead to severe reductions in output. The second chapter in this section also examines boom-bust cycles in credit markets, but focuses on the linkages between bank lending and asset prices. Using vector autoregressions, Charles Goodhart and Boris Hofmann argue that movements in property prices during the period 1985-2001 had significant effects on bank lending in a sample of twelve developed countries. Their impulse response functions, however, show that bank lending appears to be insensitive to changes in interest rates. On the other hand, asset prices seem to respond negatively to interest-rate movements. The authors provocatively conclude that there is limited scope for effectively using monetary policy as an instrument to provide financial stability in periods when there are asset-price swings, in part because the effects of interest rates on asset prices and bank lending are highly nonlinear. One challenge to their interpretation of the evidence is that monetary policy is treated in isolation from changes in bank regulation that also took place during this period. Regulatory changes likely also influenced bank lending decisions. One prominent example of this was the adoption of BIS capital-asset requirements in 1988 by Japanese banks, which strengthened the relationship between bank lending and equity prices. Banks could count 45 percent of latent capital as part of tier-II capital requirements; this ensured that increases in equity prices increased bank capital, which in turn, encouraged banks to lend more on real estate and supported rising asset prices. The third part of the book provides additional case studies of deflation. Michael Bordo and Angela Redish point out that “good” deflations are often defined as periods when prices are falling as a result of positive supply shocks (like technological progress); hence, aggregate supply outpaces aggregate demand. “Bad deflations” are periods when prices fall because aggregate demand increases faster than aggregate supply; this can occur when there are money demand shocks. They suggest, however, that this simple classification can be difficult to square with empirical evidence. Examining the United States and Canada during the classical gold standard period, they find some evidence that both negative demand shocks and positive supply shocks drove prices downward between 1870 and 1896. Output growth was more rapid during the inflationary period of 1896-1913 than the preceding period of deflation, but their time series evidence suggests that there was no causal relationship: price changes were not driving the determination of output. Michele Fratianni and Franco Spinelli look at Italian deflation and exchange-rate policy during the interwar period, and Michael Hutchinson analyzes Japan in the 1990s. These two chapters make use of a comparative historical approach. Fratianni and Spinelli compare and contrast the Italian deflation of 1927-33 with the disinflation that took place during the adoption of the EMS (1987-92) to argue that fixed exchange rates became unsustainable as economic fundamentals deteriorated. In particular, the interwar gold-exchange standard imparted a deflationary bias, which eventually led authorities to abandon the fixed exchange rate regime in order to pursue lender of last resort activities (thereby assisting failing banks and preventing banking panics) and stabilize the money supply. Hutchinson provides a nice overview of the most important recent episode of deflation, Japan, and shows how injections of liquidity by the central bank (which eventually reduced nominal rates to zero) have not been very effective at improving the growth in broad money aggregates (at least until the last few years). He examines both the liquidity trap and “credit crunch” views of the Heisei Malaise, and argues that, in spite of some policy mistakes that prolonged the deflation and made it more costly, Japan’s deflationary experience has been nowhere near as disastrous as the experience of the U.S. in the 1930s. However, Hutchinson suggests that Japanese policymakers could have made their commitment to zero-interest-rate policy more effective by also adopting an explicit inflation target. The last section provides three studies that explore the behavior of asset prices during deflations. Lance Davis, Larry Neal, and Eugene White examine how the 1890s deflation affected the core financial markets of the time. Largely narrative in its treatment, this chapter examines how the corresponding financial crisis of that decade prompted different degrees of institutional redesign and regulation in the financial markets of Paris, Berlin, New York, and London. In the next chapter, Martin Bohl and Pierre Siklos study the behavior of German equity prices during the 1910s and 1920s. They argue that this period of German history is particularly useful for analyzing the long-run validity of the present value model of asset price determination because the model can be studied for periods of deflation and hyperinflation. Their empirical results suggest that, while the theory holds for the long run, German share prices exhibited large and persistent deviations in the short run, perhaps the result of noise trading or bubbles. The final chapter by Richard Burdekin and Marc Weidenmier suggests that gold stocks might be a useful hedge against asset price deflation. They find evidence of excess returns on gold stocks after the 1929 and 2000 equity-market declines, but scant evidence of excess returns after the 1987 crash, and interpret these results as indicating that gold stocks only serve a useful hedge if asset price reversals are prolonged. Even though deflation has lost some of its immediate relevance to policymakers, there is much to be commended in the editors’ efforts to design a book that demonstrates the importance of developing a greater empirical and theoretical understanding of deflation. Although one can always quibble with the compromises that occur when assembling such a volume (for example, in this book, despite the fact that many of the chapters discuss the interwar period, there is no single chapter that attempts to examine deflation using a true panel-data approach), this book’s chapters certainly have enough thematic overlap that the sum of the articles still ends up being of greater value than the individual parts — something that is often difficult to achieve in conference volumes. In this respect, it is a welcome addition to the literature for those interested in monetary economics or those wanting an enhanced historical perspective on recent policy debates. Kris James Mitchener is assistant professor of economics and Dean Witter Foundation Fellow in the Leavey School of Business, Santa Clara University, as well as a Faculty Research Fellow with the National Bureau of Economic Research. He is currently researching sovereign debt crises during the classical gold standard period and the effects of supervision and regulation on financial stability and growth. Recent publications include “Bank Supervision, Regulation, and Financial Instability during the Great Depression,” Journal of Economic History (March 2005) and “Empire, Public Goods, and the Roosevelt Corollary” (with Marc Weidenmier), Journal of Economic History (September 2005). Sebastian Edwards, American Default: The Untold Story of FDR, the Supreme Court, and the Battle over Gold. Princeton: Princeton University Press, 2018. xxxiii + 252 pp. $30 (cloth), ISBN: 978-0-691-16188-4. Reviewed for EH.Net by Gary Richardson, Department of Economics, University of California at Irvine. The risk-free rate of return on investments is often considered to be the yield on United States government debt. “The risk-free rate is hypothetical,” Investopedia indicates, “as every investment has some type of risk associated with it. However, T-bills [United States Treasury debt obligations with a maturity of 52 weeks or less] are the closest investment possible to being risk-free for a couple of reasons.” The first is “the U.S. government has never defaulted on its debt obligations, even in times of severe economic stress.” Similar statements appear in Wikipedia’s entry on the risk-free interest rate as well as in scores of economics and finance textbooks used around the world. Sebastian Edwards’ new book, American Default: The Untold Story of FDR, the Supreme Court, and the Battle Over Gold, questions this concept underlying modern financial markets by asserting that the United States defaulted on federal debt during the 1930s, when it withdrew monetary gold from circulation and abrogated the gold clause in contracts, both public and private. Before I delve into the details of Edwards’ insightful study, I want to give you an overall assessment of the book It is fascinating, well-written, and thoroughly researched. It provides new perspective on an important era of American history. It discusses the ideas, personalities, politics, economics, and finance underlying the principal policies by which the Roosevelt administration resuscitated the United States economy after the catastrophic contraction of the early 1930s. An academic press published the book, but the clarity of its prose and vividness of the narrative make it accessible to a general audience. The book should and will be widely read. It’s worth pondering and debating, and I will debate some aspects of it later in this review. • Did the United States default on federal government debt in 1934 when it abrogated the gold clause for government bonds (particularly the fourth Liberty Bond)? • Why did the federal government abrogate the gold clause? Was this action necessary? • Who made the key decisions during this episode and how did they justify their actions? • What were the consequences for investors and for the economy as a whole, both in the United States and abroad? • Could this happen again? Edwards answers these questions over the course of 17 chapters plus an introduction, an appendix, a timeline, and a list describing the men around whom the story revolves. The introduction lays out the issues of interest. Chapters 1 through 15 narrate the story. The narrative revolves around policymakers, such as President Franklin Roosevelt, Senator Carter Glass, and members of the Supreme Court, and the men who advised them, including Roosevelt’s Brain Trust, whose initial members included Raymond Moley and Adolf Berle, law professors from Columbia University and Rexford Tugwell, an economics professor at Columbia. The narrative describes the decisions that these men made (or had to make), their rationales for making these decisions, and the state of knowledge and state of the world at the times the men made these decisions. The narrative starts in March 1932, during the economic downturn now known as the Great Depression. A few pages describe the poverty and desperation imposed upon people from all walks of life. Nearly a quarter of the labor force experienced unemployment. Commodity prices declined more than half. These declines proved particularly hard on men and women running small businesses, such as family farmers who made up a quarter of the United States population. Declining farm prices accentuated farmers’ debt burden, since the nominal value of debts remained fixed. This forced farmers who wanted to pay their mortgages and crop loans to double production (which was often impossible) or cut consumption (particularly of durable goods like cars, radios, and clothing) — and forced other farmers (and eventually almost all farmers) to stop paying their debts, default on their loans, and face bankruptcy, which often resulted in the loss of lands and livelihoods. Chapters 1 through 4 cover Roosevelt’s campaign platform and policies and the economic turmoil from November 1932 through February 1933. During these last five months of the Hoover administration, a nationwide panic drained funds from the banking system and gold from the vaults of the Federal Reserve. The public feared for the safety of deposits, and rushed to convert their claims against banks into coins and cash. The public (particularly foreign investors) also feared for the value of the dollar, since they anticipated that the Roosevelt administration might lower the gold content of U.S. currency or leave the gold standard all together, as had Britain and numerous other nations. In March, gold outflows forced the Federal Reserve Bank of New York below its gold reserve requirement. To prevent the New York Fed from shutting its doors, the newly inaugurated President Roosevelt declared a national banking holiday. This segment of the story ends by describing the policies that the Roosevelt administration implemented as it resuscitated the financial system and sparked economic recovery. This review will not go into details about decisions and the logic underlying them. For that information, you should read the book, which presents the materials cogently and clearly. You may also peruse other recent readable treatments on the topic, including The Defining Moment (Alter, 2006), FDR: The First Hundred Days (Badger, 2008), Nothing to Fear (Cohen, 2009), and Freedom from Fear (Kennedy, 1999). All of these cover similar material and reach similar conclusions. I also recommend the memoirs of Herbert Hoover and Roosevelt’s principal advisors. A list appears in Edwards’ bibliography. To it, I recommend adding the memoir of Jesse Jones, who was head of the Reconstruction Finance Corporation, Fifty Billion Dollars: My Thirteen Years with the RFC (1951). Chapters 5 through 10 describe the Roosevelt administration’s efforts to help the economy recover from the spring of 1933 through the winter of 1934. The administration believed a key cause of the catastrophic contraction was the devaluation of the dollar and decline in prices — particularly of farm commodities — that occurred during the 1920s and early 1930s. Prices of wholesale goods fell an average of 25% between 1926 and 1933. Consumer prices fell by the same amount. The average price of farm crops fell more than 66%. Declining prices made it difficult for farmers and other producers to earn sufficient profits to pay their debts, which were fixed in nominal terms, forcing families and firms to cut consumption and investment, in order to avoid bankruptcy, or forcing families and firms to default on their debts, which was often worse for them and which also put banks out of business, restricting the availability of credit, triggering banking panics, and leading to further economic contraction. The administration sought to alleviate this cycle of debt-deflation by convincing (or forcing) individuals and firms to redeposit funds in banks, encouraging banks to lend, and refilling the Federal Reserve’s vaults with gold. All of these actions would expand the money supply and eventually raise prices. The administration also sought to speed the process by directly influencing commodity prices, particularly those traded on international markets, which had fallen substantially due to foreign governments’ decisions to devalue their own currencies, usually by abandoning the gold standard and allowing the price of their currencies to be determined by market forces. The quickest way to raise commodity prices and alter the exchange rate was to change the dollar price of gold. The federal government had lowered and raised gold’s dollar price in the past. The constitution provided Congress with the power to do so. Congress authorized the president to act, by raising the dollar price of gold up to 100% (or synonymously by cutting the gold content of dollar coins up to 50%), with the Thomas Amendment to the Agricultural Adjustment Act in May 1933. The Roosevelt administration used these powers to the utmost, periodically and persistently raising gold’s dollar price from the spring of 1933 through the winter of 1934. Roosevelt’s gold program concluded in January 1934, with the passage of the Gold Reserve Act, which set gold’s official price at $35 per troy ounce. Gold clauses in contracts impeded this policy. An example was printed on Liberty Bonds: “The principal and interest hereof are payable in United States gold coin of the present standard of value.” Clauses like this were common in public and private contracts. Their intent was to protect creditors from declines in the value of currency or inflation, which is the same phenomenon but stated as an increase in the average price of goods. Gold clauses ensured lenders that they would be repaid with currency or gold coins with the same real value, in terms of the goods and services that they could purchase, as the funds that they had lent. Gold clauses had a pernicious effect, however, when deflations and devaluation decisions of foreign governments reduced prices and economic activity. Then, gold clauses prevented governments from quickly and effectively remedying the situation by altering the money supply, interest rates, exchange rates, and prices to push the economy back toward equilibrium. In Chapter 16, Edwards admits monetary expansion was the optimal policy to pursue. He “strongly” believes it was the “main force behind the recovery” (p. 188). He indicates, correctly, that this is the consensus of scholars who have studied the issue. He offers no alternative. The Roosevelt administration understood this problem, and on May 29, convinced Congress to void gold clauses in all contracts retroactively and in the future. Chapters 5 through 10 do a good job of conveying this material and describing the thought-process of the Roosevelt administration as it struggled to make difficult decisions in real time with limited information. The chapters reflect the conventional wisdom found in canonical accounts of this period including Milton Friedman and Anna Schwartz’s (1960) Monetary History of the United States, Peter Temin’s (1989) Lessons from the Great Depression, and Barry Eichengreen’s Golden Fetters (1992). The chapters also do a good job of describing concerns and criticisms of Roosevelt’s recovery plans. Perhaps as a narrative device, the chapters do not tell you who was right. That material appears one hundred pages later in Chapter 16. Chapters 11 to 15 contain the novel part of the narrative. They describe investors’ reactions to Roosevelt’s gold policies and the abrogation of the gold clause. Investors quickly sued in state and federal courts, demanding that borrowers repay debts with gold coin, as required by gold clauses, rather than currency, as determined by Congress. Courts consistently ruled against plaintiffs, usually indicating that the Constitution gave Congress the power “to coin money and regulate the value thereof” and to determine what was legal tender for the discharge of public and private debts. Plaintiffs appealed these decisions, and the cases quickly reached the Supreme Court. American Default’s coverage of these court cases is seminal and stimulating. I know the literature on this topic well. As the official Historian of the Federal Reserve System, I wrote essays on “Roosevelt’s Gold Program” and the “Gold Reserve Act of 1934” which appear on the Federal Reserve’s historical web site. I have read much of what scholars have published on this topic. I know of no comparable source for information on these court cases, the arguments presented by the plaintiffs and defendants, and the rationale underlying the Supreme Court’s confusing decision that Congress’s abrogation of the gold in private contracts was constitutional while Congress’s abrogation of the gold clause for government bonds, particularly the Liberty Bonds, was constitutional in some ways but unconstitutional in others, did not harm the plaintiffs, and therefore would not be overturned by the courts. Now, we get to one point on which I disagree with the author. Edwards clearly believes the United States federal government defaulted on its debts. The Supreme Court equivocated, but generally seemed to think that the United States did not default, and I agree with the Supreme Court. Let me explain. Merriam-Webster’s dictionary defines a default as either a (1) failure to do something required by duty or law or (2) a failure to pay financial debts. The United States Supreme Court decision in the gold cases indicated that the federal government defaulted in the first sense. It did not fulfill a promise printed on the bonds, which was to literally repay bondholders with United States gold coins at the standard of value that prevailed when the bonds were issued in 1918. At that time, the basic gold coin was the Eagle. It was worth $10 and contained 0.48375 troy ounces of gold and 0.05375 troy ounces of copper. So, a Liberty Bond with a face value of $100 promised upon maturity payment of 10 gold Eagles containing a total of 4.8375 troy ounces of gold and 0.5375 troy ounces of copper. When Liberty Bonds matured in 1938, however, the government gave bondholders neither the Eagles nor the metals that they contained. The Supreme Court ruled that the federal government did not default in the second sense. The government fully paid its financial debts. The latter conclusion requires explanation, particularly because the book emphasizes the “American Default” aspect of the Supreme Court’s decision. The Supreme Court justified this conclusion based upon two arguments originally advanced by the federal government. The first argument began with the fact that in 1933, the federal government had withdrawn all monetary gold from circulation and paid in return paper currency at the standard of value which had prevailed since 1900. This meant that an individual holding 10 Eagle coins had to give them to the government and accept $100 in paper currency in return. The government argued that Liberty bond holders could and should be treated the same way as everyone else in the United States. In a hypothetical scenario, when the bonds matured, the government would pay bondholders the gold coins as promised, but then the government would also immediately confiscate those coins and compensate the former bondholders with currency at the same rate as everyone else had been compensated a few years before. This hypothetical sequence of transactions was legal. The U.S. Constitution enumerated Congress’s power to determine the standards of coinage and legal tender. These enumerated powers enabled Congress to convert gold coins to paper currency and/or redefine the standards of value and objects accepted as payment for public and private debts. If the government executed this hypothetical sequence of transactions when the bonds matured in 1938, an individual who had purchased a $100 Liberty Bond in 1918 would in the end receive $100 in currency. The Supreme Court ruled that it was acceptable for the government to give that currency directly to the bondholders upon maturity, rather than go to the hassle of giving them gold coins, taking them back, and then paying the currency to them. To understand the second argument that abrogating the gold clause did not involve a financial default, it may help to step back from the legal technicalities and think of the repayment in an economic sense. The purpose of the gold clause was the protect bond holders from a fall in the value of American currency, a phenomenon known as inflation. The clause promised that individuals who invested in the United States would be repaid with dollars whose real value in terms of goods and services was equivalent to the real value of the dollars with which they purchased the bonds. Did the United States government do this? The answer is yes. The purchasing power of the dollar rose four percent between 1918, when the fourth Liberty Bond was issued, and 1938, when the fourth Liberty Bond matured. So, an American citizen who in 1918 purchased a $100 Liberty Bond received in 1938 funds sufficient to purchase goods and services that would have cost $104 in 1918. The government also paid 4.5% interest each year along the way. So, the government did honor its pledge to maintain the purchasing power of the funds entrusted to it by purchasers of Liberty Bonds and return that to them plus interest. What about foreigners? They owned many U.S. bonds. The largest group of foreign investors were English. Their position is worth considering. In October 1918, when the Liberty Bonds were issued, the dollar-pound exchange rate was 4.77. An English investor could exchange ₤1 for $4.77 and purchase a $100 Liberty Bond for ₤20.96. In October 1938, when the Liberty Bonds matured, the dollar-pound exchange rate was 4.77. So, an English investor who redeemed his bond for $100 in U.S. currency could convert that into ₤20.96, exactly what they had paid for it, and with those funds, they could buy goods which would have been valued at ₤46.69 in 1918, since the purchasing power of the pound had risen substantially since that time. So, English investors, like many others overseas, made large profits from investing in Liberty Bonds. Plaintiffs in the gold clause cases before the Supreme Court hoped that their suit would allow them to reap even higher returns. They argued that the government should be required to pay them with old gold coins, like the Eagle, at the 1918 standard of value, and then they should be able to convert the Eagles to dollars at the price established by the Gold Reserve Act of 1934 ($35 per troy ounce of gold). The government countered that this plan was infeasible. There was not enough gold in the U.S. to pay gold to all Liberty Bond holders. That plan was also illegal. The law no longer allowed the public to own, save, or spend monetary gold. In that case, the plaintiffs argued, they should receive the amount which would result from a hypothetical sequence of transactions where the government gave them gold coins at the 1918 standard of value (as stated on the bonds) and then immediately converted that gold to currency at the 1934 standard of value. This sequence would pay $166.67 on a $100 Liberty Bond upon maturity in 1938, a sum sufficient to purchase goods and services which would have cost $174.19 in 1918. The majority of the Supreme Court rejected this claim and referred to it as unjust enrichment. Chapter 16 discusses the consequences of the abrogation of the gold clause. At the time, opponents of the policy contended that its effects could be catastrophic. Contracts would not be trusted. Creditors would no longer want to extend loans. Interest rates would rise. Investment would fall. The economy would stagnate. Edwards looks for evidence of these ailments in data on investment, borrowing, bonds, stocks, prices, interest rates, and output and finds none. After abrogation, the government actually found it easier to borrow, rather than harder. Edwards concludes that there is “no evidence of distress or dislocation in the period immediately following the abrogation, or the Court ruling. … it is possible that if the gold clause had not been abrogated, output and investment would have recovered faster than they did, and that the costs of borrowing would have declined even more. Those outcomes are possible, but in my view, highly unlikely” (p. 195). The reason abrogation had no detectable impact, Edwards concludes, was that it was an excusable default. Excusable defaults occur under circumstances “when the market understands that a debt restructuring is, indeed, warranted, and beneficial for (almost) everyone involved in the marketplace” (p. 197), when the restructuring is done according to existing legal rules, and when the default is largely a domestic matter, with few foreigners involved. Excusable defaults do not stigmatize sovereigns, since they do not change borrowers’ expectations of sovereigns’ probability of repaying future debts. I agree with Edwards that the abrogation of the gold clause fit these circumstances, and I argued, in the preceding paragraphs, that the abrogation fit another classic characteristic of an excusable default. Bondholders received payment equal to (or better than) what they expected when the debt was issued. Since past holders of Liberty Bonds received the repayments that they expected when they purchased the bonds on origination in 1918, despite the tremendous shocks to the United States and world economies between then and maturity in 1938, future bondholders had no reason to doubt that their expectations would not be met. Could it happen again? The author asks that question at the beginning and end of the book (and in the title to Chapter 17), because he says “among all questions, [it was] the one that kept coming back again and again” (p. 201). In emerging economies, Edwards indicates, “situations that mirror what happened in the United States during 1933-1935 have occurred recently in a number of … countries, and it is almost certain that they will continue to arise in the future” (p 203). Examples from the recent past include Argentina, Mexico, Turkey, Russia, Indonesia, and Chile. Advanced economies are not immune from these economic forces. In 2008, Iceland faced “a gigantic external crisis with a massive devaluation and a complete collapse of the banking sector. It took almost ten years for Iceland to recover” (p. 205). Greece continues to struggle with a similar situation. So do other European nations, such as Portugal, Italy, and Spain. These nations may be tempted to leave the Eurozone, reintroduce independent currencies, and devalue their exchange rate in order to speed economic recovery. But, any nation that tries (or is forced) to do this will struggle with contracts, all of which are written requiring payment in Euros. If these are rewritten to permit repayment in new currencies of lesser value, the issue is sure to end up in domestic and foreign courts as well as the World Bank’s tribunal for international investment disputes. While the rest of the world may be in danger of experiencing events similar to the U.S. abrogation crisis of the 1930s, Edwards argues that “it is almost impossible that something similar will happen again in the United States” (p. 201). The main reasons are the change in the monetary system and the exchange rate regime. The United States’ exchange rates are now determined by market forces. Gold no longer underlies the monetary system. Most contracts are denominated in lawful currency, not gold, commodities, or foreign currency. Even if a repeat is extremely unlikely, the chance of the United States restructuring its debt, Edwards argues, is not zero. The federal debt outstanding is now nearly equal to gross domestic product. A tenth of the debt is fixed in real terms, because upon maturity, bondholders receive a premium payment linked to increases in the Consumer Price Index. The implicit debt for future entitlement, particularly Medicare, Medicaid, and Society Security, exceeds 400 percent of gross domestic product. There is little agreement on how to pay for these promises, Edwards notes, and at some point in the not-too-distant future, the U.S. government may be forced to restructure these payments. This potential crisis, Edwards argues, differs from the crisis of the 1930s, because the abrogation crisis stemmed from deflation, exchange rates, and the structure of the monetary system. The modern problem arises from promises made in the present for the future delivery of services. On all of these points, I agree with Edwards. I am, however, less hopeful for the future. The unsustainable federal debt is not an accident. It was consciously created by Republican politicians to justify reducing (or eliminating) future federal entitlements. With Republicans in control of all three branches [When the review was published by Cato, this was true. However, Republicans now control only half of Congress] of the federal government, taxes cut, deficits up, and a recession on the horizon, the day of reckoning may be upon us in the near future. I anticipate a massive abrogation of federal medical and retirement entitlements within the next decade and sooner if Republicans retain control of Congress and the Presidency through 2020. The roots of the past and current crises may have more in common than Edwards indicates. Most payments for federal entitlement programs are indexed for inflation. Federal entitlement obligations are, in other words, guaranteed in real terms, just like payments for Liberty Bonds one hundred years ago. They cannot be adjusted on aggregate by monetary policies that generate inflation. The can only be adjusted through the legislature and the courts. On this point, Edwards’ American Default ends on a high note. The ability of the United States to deal with the crisis of the 1930s and the abrogation of the gold clause demonstrates the strength of our legislative and judicial institutions. Given these, it is likely that our nation will be able to overcome future federal financial restructurings. Memories of those events will fade. The will be forgotten just like the events that Edwards masterfully recounts in his book, and America’s federal debt will remain the risk-free standard for the rest of the world. Alter, Jonathan. The Defining Moment: FDR’s Hundred Days and the Triumph of Hope. Simon & Schuster, 2006. Badger, Anthony J. FDR: The First Hundred Days. Hill and Wang, 2008. Cohen, Adam. Nothing to Fear: FDR’s Inner Circle and the Hundred Days That Created Modern America. Penguin Press, 2009. Kennedy, David M. Freedom from Fear: The American People in Depression and War, 1929-1945. Oxford University Press, 1999. Investopedia. “Risk-Free Rate of Return”. Retrieved June 21, 2018. Richardson, Gary, Michael Gou, and Alejandro Komai. “Gold Reserve Act of 1934.” Federal Reserve History Web Site. Retrieved June 26, 2018. https://www.federalreservehistory.org/essays/roosevelts_gold_program. Richardson, Gary, Michael Gou, and Alejandro Komai. “Roosevelt’s Gold Program.” Federal Reserve History Web Site. Retrieved June 26, 2018. https://www.federalreservehistory.org/essays/roosevelts_gold_program. Temin, Peter. Lessons from the Great Depression. MIT Press, 1989. This review was originally published in Regulation, Fall 2018. Gary Richardson was the editor of the Federal Reserve’s historical web site, https://www.federalreservehistory.org/, on which he wrote a series of articles about the Roosevelt Administration’s gold policies. He is the author of numerous academic articles on the history of money, banking, and the Federal Reserve. Phillip G. Payne, Crash! How the Economic Boom and Bust of the 1920s Worked. Baltimore: Johns Hopkins University Press, 2015. viii +142 pp. $20 (paperback), ISBN: 978-1-4214-1856-8. Reviewed for EH.Net by Randall Parker, Department of Economics, East Carolina University. Crash! is a part of the “How Things Worked” series being published by Johns Hopkins University Press. The list of books included in this series is not particularly long (at least not yet) and includes books on Ellis Island, sod busting, and Union Army recruitment of U.S. colored troops, among other topics. I like the idea behind this series, and the editors have really done themselves proud by having Phillip Payne author this book on the boom and bust of the 1920s. It is the first entry in the series pertaining to economic history. Payne is a professor of history at St. Bonaventure University. If the idea behind the “How Things Worked” series is to produce non-technical books that provide useful road maps that hit the high points of historical epochs and give undergraduates the fundamental knowledge they need to understand the basics of what went on and why, then Crash! accomplishes what it sets out to do. Payne provides an in-depth look at the 1920s and the emergence of speculation and how the culture and economy of the time promoted that unhealthy trait (that still afflicts us today and ever shall). All the usual suspects and their stories are told: James Riordan and Ivar Kreuger (and others who did themselves in), Richard Whitney and his attempt to save U.S. Steel share prices, J.P. Morgan and others. The roles they played in bringing about the unfortunate events of 1929 and the beginning of the Depression with the stock market crash are described with historical elegance and come alive in the words of Payne. The level of detail of the events and the actors that made them happen represent a new and fresh look at a familiar, and certainly guilty, culprit in helping to bring about the Great Depression. The last thirty pages of the book are also a road map for the essential elements of the recovery from the Depression, the emergence and governance of Franklin Roosevelt and the New Deal, plus an Epilogue comparing the 1920s to the malaise we endured in 2008. Correctly saying “How This Time Is (Not) Different,” we are reminded that this pattern will almost certainly repeat sometime down the road. There are some particularly enlightening parts of the book. The West Virginia Coal Wars in the early 1920s and the use of air power against American civilians is not something economists hear much about. But the shock I felt when I read about it cannot be overstated. Moreover, I had forgotten that Herbert Hoover blamed World War I for the Great Depression. Payne reminds us that it was not Peter Temin who originally made this connection, although Temin did it for the right reasons and blamed the establishment of the interwar gold standard in a changed world in which the gold standard no longer functioned well and was an agent of deflation and depression. There are several spots where the economics of the era are just briefly mentioned and not discussed much. There is no mention of the major debate of whether there was a bubble in stocks or not in the 1920s. This is far from clear from the literature — and my judgment is that it never will be decided. Alas, there is only one sentence mentioning that both Irving Fisher and John Maynard Keynes thought stock prices would continue to grow and both lost their fortunes. Moreover, there is no discussion of how deflation and the gold standard were linked. The recession of 1920-21 is blamed on deflation with no mention of this necessity for the re-establishment of a gold-backed currency at antebellum prices. But I do not wish to overstate the case. Payne does what he sets out to do and he is to be credited for such a readable book (indeed I read it twice!). There is one matter, however, that cannot be unmentioned. I joined this club many years ago when James Hamilton showed me the error of my ways in a working paper I had sent him. It is a club to which Phillip Payne now belongs — and he should delight in being a part of this club as the membership list is long . . . and now we have one more. In four different places, he refers to “the Bank of the United States.” Well, it is really “the Bank of United States,” there is no “the” between “of” and “United.” Welcome to the club Professor Payne. And thanks for this very useful historical description of the bumpy road during the interwar period. Randall Parker is editor of The Seminal Works of the Great Depression (Edward Elgar, 2011) and co-editor (with Robert Whaples) of The Handbook of Modern Economic History and The Handbook of Major Events in Economic History (both from Routledge, 2013). Copyright (c) 2017 by EH.Net. All rights reserved. This work may be copied for non-profit educational uses if proper credit is given to the author and the list. For other permission, please contact the EH.Net Administrator (administrator@eh.net). Published by EH.Net (September 2017). All EH.Net reviews are archived at http://www.eh.net/BookReview. Jeffry A. Frieden, Currency Politics: The Political Economy of Exchange Rate Policy. Princeton, NJ: Princeton University Press, 2014. xi + 301 pp. $40 (cloth), ISBN: 978-0-691-16415-1. Jeffry A. Frieden, Professor of Government at Harvard University, has written a fine book on the determinants of decision-making regarding exchange-rate regime and, to some extent, exchange-rate level within the selected regime. The book is readable for both economists and political scientists. I recommend Currency Politics to both sets of scholars. Economists will learn about the political aspects of exchange-regime choice and political scientists about the economic aspects. There are seven formal chapters, preceded by an introduction and followed by a brief concluding section. The references constitute a useful if selective body of literature, and the index is well-done. Chapter one, titled “The Political Economy of Currency Choice,” presents the author’s theory. Chapters two and three, dealing with the U.S. experience from 1862 to 1879, is the section of the book most relevant to economic historians. The exchange-regime controversies during the greenback and silver-controversy periods are well analyzed within the author’s theoretical framework. Attention is paid to contemporary views and to pertinent data, and innovative econometric investigations are included. Chapters four (European Monetary Integration), five and six (Latin American experience) are empirical but not historical, as they deal with recent experience. Chapter seven (“The Politics of Exchange Rates: Implications and Extensions”) is bizarre, running breathlessly from case to case, even discussing China’s undervalued currency. The author’s model involves exchange-rate regime determination by the relative political strengths of economic groups advantaged by exchange-rate stability (gold standard, euro, peg to dollar or deutschmark) and groups advantaged by exchange-rate flexibility and domestic currency depreciation. The former groups generally include the financial sector, producers of differentiated products (“specialized manufacturers”), and foreign-currency debtors; the latter, mainly tradables producers. Frieden warrants praise by economists for his uniform and careful attention to economic incentives as analytical support for his approach. Very impressive is Frieden’s voting model to test the greenback-period economic groupings for “soft money” (against gold, currency contraction, and deflation) versus “hard money” (in favor of return to the former gold standard, and the contraction and deflation to make this possible). A voting model with Congressional (House) district as the unit has creative dependent and explanatory variables, based on Census data. For the 1860s, twenty-four votes involving the Contraction Act (or its suppression) and the redemption medium (gold or greenbacks) for government bonds, are incorporated. Results are consistent with the author’s theory: “Members of Congress specifically were more likely to vote for soft money if their constituency was less wealthy, and if more of their constituency’s economic activities were in import-sensitive manufacturing (i.e., in New England and Pennsylvania) or farming, especially of export crops” (pp. 95-96). For the 1870s, a similar analysis involves six House bills, five of which failed to become law — but no matter. With a later Census, data are richer, and explanatory variables now include debt by Congressional district. This leads to an unexpected result, as districts with larger debt are in favor of gold! Frieden explains this anomaly by inferring that concern about nominal debt was not an important motivating force. Hmm! The chapter on European monetary integration gives Frieden the opportunity to investigate the impact of domestic-price pass-through effects of exchange-rate change, an integral part of his model. Now the econometrics has countries as the basic unit, as is also the case for the Latin American experience. The book is full of wise insights, some of which seem obvious. For example, “the more open an economy is, the more politically controversial its currency policy is likely to be” (p. 249). The author also notes the well-known flexibility of wages and prices in enhancing the classical gold standard. He makes the important point, not always emphasized, that the sustainability of the classical gold standard was founded on the consensus of elite groups internationally: countries must follow gold-standard rules, and rules should not be altered to fit the preferences of national governments — whence the U.S. deflationary policy during the greenback period, in order to return to the gold standard. As befitting a political scientist, Frieden notes the lack of democracy — hence the absence of political power of groups benefitting from currency depreciation — in fostering the stability of the gold standard. I wish that he had devoted more attention to this oft-neglected aspect of the gold standard. I also wish that Frieden had applied his model — both theoretically and, data permitting, econometrically — to other cases of exchange-rate regime controversy, especially the various bullionist periods (in particular, English and Swedish). He says nothing about these experiences. Without doubt, however, Frieden has set a high political-economic standard against which other interdisciplinary studies of exchange-rate regimes will have to measure themselves. Lawrence H. Officer is Professor of Economics at University of Illinois at Chicago. His most recent books are Two Centuries of Compensation for U.S. Production Workers in Manufacturing and Everyday Economics: Honest Answers to Tough Questions, both published by Palgrave Macmillan. Sara Hsu, Financial Crises, 1929 to the Present. Cheltenham, UK: Edward Elgar, 2013. v + 178 pp. $100 (cloth), ISBN: 978-0-85793-342-3. In Financial Crises, 1929 to the Present, Sara Hsu of the State University of New York, New Paltz, offers a concise history of several of the world’s major financial crises — from the Great Depression to the subprime mortgage crisis of 2007-08 and European debt crisis of 2009-10. Financial crises are not easy to define precisely, except perhaps in the context of a stylized model, and different authors have used a variety of quantitative measures to identify and measure the severity of crises. In the first chapter of the book, Hsu explains how different authors define financial crises, focusing especially on the ideas of Hyman Minsky and Charles Kindleberger. Hsu provides neither a precise theoretical nor a quantitative definition of a financial crisis, but aligns herself with Minsky in concluding that unregulated financial systems of capitalist economies are inherently prone to instability and crises with potentially severe macroeconomic repercussions: “Hyman Minsky was right in the sense that given free rein, capitalism has created instability and unanticipated crises” (p. 146). After a brief summary of how the global financial system has evolved since the 1930s, subsequent chapters review the histories of individual crises, beginning with the Great Depression. Hsu follows John Kenneth Galbraith in tracing the origins of the Great Depression to Wall Street speculation and attributes the eventual market crash to heightened uncertainty and a global credit crunch associated with French claims on British gold and the introduction of the Young Plan in 1929. Although she acknowledges the decline in the money stock and deflation that took hold after the crash, Hsu rejects the view of Friedman and Schwartz (1963) that banking panics and a contracting money supply caused the Great Depression, favoring instead Ben Bernanke’s (1983) emphasis on the nonmonetary effects that financial crises had on the economy. The Great Depression led to major changes in the regulation of U.S. banks and financial markets, as well as disintegration of the international gold standard and the imposition of capital and exchange controls around the world. Controls became universal during World War II and remained in place for several years after the war under the post-war Bretton Woods system of fixed exchange rates. Hsu nicely summarizes key features of the Bretton Woods System and its breakdown in the 1970s in the book’s third chapter. The remaining chapters summarize major financial crises, beginning with the debt crises of emerging market economies in the 1980s. Hsu explains how many emerging market economies had borrowed heavily to support economic growth when commodity prices were rising in the 1970s, only to experience difficulty servicing their debts and obtaining new loans when commodity prices fell after the Federal Reserve tightened monetary policy and the U.S. economy went into recession in the early 1980s. This chapter has an especially good summary of how the debt crisis unfolded in different countries and how lenders, governments, and the IMF responded. Hsu next discusses several crises that occurred in the 1990s, including the Western European exchange rate crisis, Nordic banking crises, Japanese real estate collapse and subsequent “lost decade,” Mexican debt crisis, and Asian financial crisis. A subsequent chapter describes the Russian and Brazilian financial crises of 1998 and the Argentinian crisis of 2000. Like many others, Hsu is highly critical of the “conditionality” requirements imposed by the IMF on nations in crisis. For example, she argues that “The IMF program for Korea went beyond measures needed to resolve the crisis … and, destructively, called for even wider opening(!) of Korea’s capital and current accounts” (p. 91). The penultimate chapter of the book focuses on the subprime mortgage crisis and recession of 2007-08, which originated in the United States but was felt around the world, and the European debt crisis that emerged in 2009-10. For Hsu, “the crisis showed that all financial markets are unstable and require constant supervision and regulation” (p. 129). She blames “excessive overleveraging” of subprime assets in the form of opaque financial instruments created by a largely unregulated and unsupervised banking system and the trading of those securities “over the counter” rather than through organized and regulated exchanges. She argues that much of the government’s response to the crisis, such as the Troubled Asset Relief Program, was flawed and failed to halt the crisis. The final chapter considers alternative policies for preventing future crises and for containing and resolving any crises that might occur. Hsu is generally supportive of capital controls, macro-prudential bank regulations, and countercyclical fiscal and monetary policy, as well as greater coordination of policies across countries. Indeed, she argues that “The preeminence of country sovereignty and competitiveness over global financial stability ensures that fault lines will exist and expand, and that crises will continue to occur. Should country priorities shift en masse from economic growth to economic and financial stability, there is a much greater probability that future financial crises might be prevented” (p. 146). The book could serve as a supplement for undergraduate courses in economic history, international finance, and macroeconomics or as a reference for anyone wishing summaries of the key events and issues surrounding particular crises. However, the book might hold less appeal for courses in U.S. economic history because it does not cover several noteworthy episodes of financial instability in the United States, such as the savings and loan crisis of the 1980s. Further, readers interested in more theoretical explanations of the causes and effects of financial crises or those interested in the interplay of political and economic forces that shape the financial regulatory environment and can promote instability and crises even in highly regulated financial systems, as discussed recently by Charles Calomiris and Stephen Haber (2014), will want to look elsewhere. Bernanke, Ben S. “Nonmonetary Effects of the Financial Crisis in the Propagation of the Great Depression,” American Economic Review 73(3), June 1983, pp. 257-76. Calomiris, Charles W. and Stephen H. Haber. Fragile by Design: The Political Origins of Banking Crises and Scarce Credit. Princeton: Princeton University Press, 2014. David C. Wheelock researches U.S. financial and monetary history. His recent publications include (with Michael D. Bordo), “The Promise and Performance of the Federal Reserve as Lender of Last Resort,” in M.D. Bordo and W. Roberds, editors, The Origins, History, and Future of the Federal Reserve: A Return to Jekyll Island. Cambridge University Press, 2013. Private turnpikes were business corporations that built and maintained a road for the right to collect fees from travelers.2 Accounts of the nineteenth-century transportation revolution often treat turnpikes as merely a prelude to more important improvements such as canals and railroads. Turnpikes, however, left important social and political imprints on the communities that debated and supported them. Although turnpikes rarely paid dividends or other forms of direct profit, they nevertheless attracted enough capital to expand both the coverage and quality of the U. S. road system. Turnpikes demonstrated how nineteenth-century Americans integrated elements of the modern corporation – with its emphasis on profit-taking residual claimants – with non-pecuniary motivations such as use and esteem. Private road building came and went in waves throughout the nineteenth century and across the country, with between 2,500 and 3,200 companies successfully financing, building, and operating their toll road. There were three especially important episodes of toll road construction: the turnpike era of the eastern states 1792 to 1845; the plank road boom 1847 to 1853; and the toll road of the far West 1850 to 1902. Prior to the 1790s Americans had no direct experience with private turnpikes; roads were built, financed and managed mainly by town governments. Typically, townships compelled a road labor tax. The State of New York, for example, assessed eligible males a minimum of three days of roadwork under penalty of fine of one dollar. The labor requirement could be avoided if the worker paid a fee of 62.5 cents a day. As with public works of any kind, incentives were weak because the chain of activity could not be traced to a residual claimant – that is, private owners who claim the “residuals,” profit or loss. The laborers were brought together in a transitory, disconnected manner. Since overseers and laborers were commonly farmers, too often the crop schedule, rather than road deterioration, dictated the repairs schedule. Except in cases of special appropriations, financing came in dribbles deriving mostly from the fines and commutations of the assessed inhabitants. Commissioners could hardly lay plans for decisive improvements. When a needed connection passed through unsettled lands, it was especially difficult to mobilize labor because assessments could be worked out only in the district in which the laborer resided. Because work areas were divided into districts, as well as into towns, problems arose coordinating the various jurisdictions. Road conditions thus remained inadequate, as New York’s governors often acknowledged publicly (Klein and Majewski 1992, 472-75). For Americans looking for better connections to markets, the poor state of the road system was a major problem. In 1790, a viable steamboat had not yet been built, canal construction was hard to finance and limited in scope, and the first American railroad would not be completed for another forty years. Better transportation meant, above all, better highways. State and local governments, however, had small bureaucracies and limited budgets which prevented a substantial public sector response. Turnpikes, in essence, were organizational innovations borne out of necessity – “the states admitted that they were unequal to the task and enlisted the aid of private enterprise” (Durrenberger 1931, 37). America’s very limited and lackluster experience with the publicly operated toll roads of the 1780s hardly portended a future boom in private toll roads, but the success of private toll bridges may have inspired some future turnpike companies. From 1786 to 1798, fifty-nine private toll bridge companies were chartered in the northeast, beginning with Boston’s Charles River Bridge, which brought investors an average annual return of 10.5 percent in its first six years (Davis 1917, II, 188). Private toll bridges operated without many of the regulations that would hamper the private toll roads that soon followed, such as mandatory toll exemptions and conflicts over the location of toll gates. Also, toll bridges, by their very nature, faced little toll evasion, which was a serious problem for toll roads. The more significant predecessor to America’s private toll road movement was Britain’s success with private toll roads. Beginning in 1663 and peaking from 1750 to 1772, Britain experienced a private turnpike movement large enough to acquire the nickname “turnpike mania” (Pawson 1977, 151). Although the British movement inspired the future American turnpike movement, the institutional differences between the two were substantial. Most important, perhaps, was the difference in their organizational forms. British turnpikes were incorporated as trusts – non-profit organizations financed by bonds – while American turnpikes were stock-financed corporations seemingly organized to pay dividends, though acting within narrow limits determined by the charter. Contrary to modern sensibilities, this difference made the British trusts, which operated under the firm expectation of fulfilling bond obligations, more intent and more successful in garnering residuals. In contrast, for the American turnpikes the hope of dividends was merely a faint hope, and never a legal obligation. Odd as it sounds, the stock-financed “business” corporation was better suited to operating the project as a civic enterprise, paying out returns in use and esteem rather than cash. The first private turnpike in the United States was chartered by Pennsylvania in 1792 and opened two years later. Spanning 62 miles between Philadelphia and Lancaster, it quickly attracted the attention of merchants in other states, who recognized its potential to direct commerce away from their regions. Soon lawmakers from those states began chartering turnpikes. By 1800, 69 turnpike companies had been chartered throughout the country, especially in Connecticut (23) and New York (13). Over the next decade nearly six times as many turnpikes were incorporated (398). 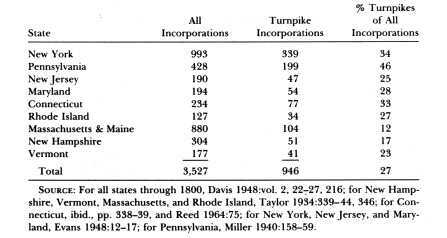 Table 1 shows that in the mid-Atlantic and New England states between 1800 and 1830, turnpike companies accounted for 27 percent of all business incorporations. As shown in Table 2, a wider set of states had incorporated 1562 turnpikes by the end of 1845. Somewhere between 50 to 70 percent of these succeeded in building and operating toll roads. A variety of regulatory and economic conditions – outlined below – account for why a relatively low percentage of chartered turnpikes became going concerns. In New York, for example, tolls could be collected only after turnpikes passed inspections, which were typically conducted after ten miles of roadway had been built. Only 35 to 40 percent of New York turnpike projects – or about 165 companies – reached operational status. In Connecticut, by contrast, where settlement covered the state and turnpikes more often took over existing roadbeds, construction costs were much lower and about 87 percent of the companies reached operation (Taylor 1934, 210). Source: Klein and Fielding 1992: 325. Turnpikes promised little in the way of direct dividends and profits, but they offered potentially large indirect benefits. Because turnpikes facilitated movement and trade, nearby merchants, farmers, land owners, and ordinary residents would benefit from a turnpike. Gazetteer Thomas F. Gordon aptly summarized the relationship between these “indirect benefits” and investment in turnpikes: “None have yielded profitable returns to the stockholders, but everyone feels that he has been repaid for his expenditures in the improved value of his lands, and the economy of business” (quoted in Majewski 2000, 49). Gordon’s statement raises an important question. If one could not be excluded from benefiting from a turnpike, and if dividends were not in the offing, what incentive would anyone have to help finance turnpike construction? The turnpike communities faced a serious free-rider problem. If it is a question of taking a road past his property, [a man] sees at once that this small public matter has a bearing on his greatest private interests, and there is no need to point out to him the close connection between his private profit and the general interest. … Local liberties, then, which induce a great number of citizens to value the affection of their kindred and neighbors, bring men constantly into contact, despite the instincts which separate them, and force them to help one another. … The free institutions of the United States and the political rights enjoyed there provide a thousand continual reminders to every citizen that he lives in society. … Having no particular reason to hate others, since he is neither their slave nor their master, the American’s heart easily inclines toward benevolence. At first it is of necessity that men attend to the public interest, afterward by choice. What had been calculation becomes instinct. By dint of working for the good of his fellow citizens, he in the end acquires a habit and taste for serving them. … I maintain that there is only one effective remedy against the evils which equality may cause, and that is political liberty (Alexis de Tocqueville, 511-13, Lawrence/Mayer edition). Tocqueville’s testimonial is broad and general, but its accuracy is seen in the archival records and local histories of the turnpike communities. Stockholder’s lists reveal a web of neighbors, kin, and locally prominent figures voluntarily contributing to what they saw as an important community improvement. Appeals made in newspapers, local speeches, town meetings, door-to-door solicitations, correspondence, and negotiations in assembling the route stressed the importance of community improvement rather than dividends.4 Furthermore, many toll road projects involved the effort to build a monument and symbol of the community. Participating in a company by donating cash or giving moral support was a relatively rewarding way of establishing public services; it was pursued at least in part for the sake of community romance and adventure as ends in themselves (Brown 1973, 68). It should be noted that turnpikes were not entirely exceptional enterprises in the early nineteenth century. In many fields, the corporate form had a public-service ethos, aimed not primarily at paying dividends, but at serving the community (Handlin and Handlin 1945, 22, Goodrich 1948, 306, Hurst 1970, 15). Given the importance of community activism and long-term gains, most “investors” tended to be not outside speculators, but locals positioned to enjoy the turnpikes’ indirect benefits. “But with a few exceptions, the vast majority of the stockholders in turnpike were farmers, land speculators, merchants or individuals and firms interested in commerce” (Durrenberger 1931, 104). A large number of ordinary households held turnpike stock. Pennsylvania compiled the most complete set of investment records, which show that more than 24,000 individuals purchased turnpike or toll bridge stock between 1800 and 1821. The average holding was $250 worth of stock, and the median was less than $150 (Majewski 2001). Such sums indicate that most turnpike investors were wealthier than the average citizen, but hardly part of the urban elite that dominated larger corporations such as the Bank of the United States. County-level studies indicate that most turnpike investment came from farmers and artisans, as opposed to the merchants and professionals more usually associated with early corporations (Majewski 2000, 49-53). Turnpikes became symbols of civic pride only after enduring a period of substantial controversy. In the 1790s and early 1800s, some Americans feared that turnpikes would become “engrossing monopolists” who would charge travelers exorbitant tolls or abuse eminent domain privileges. Others simply did not want to pay for travel that had formerly been free. To conciliate these different groups, legislators wrote numerous restrictions into turnpike charters. Toll gates, for example, often could be spaced no closer than every five or even ten miles. This regulation enabled some users to travel without encountering a toll gate, and eased the practice of steering horses and the high-mounted vehicles of the day off the main road so as to evade the toll gate, a practice known as “shunpiking.” The charters or general laws also granted numerous exemptions from toll payment. In New York, the exempt included people traveling on family business, those attending or returning from church services and funerals, town meetings, blacksmiths’ shops, those on military duty, and those who lived within one mile of a toll gate. In Massachusetts some of the same trips were exempt and also anyone residing in the town where the gate is placed and anyone “on the common and ordinary business of family concerns” (Laws of Massachusetts 1805, chapter 79, 649). In the face of exemptions and shunpiking, turnpike operators sometimes petitioned authorities for a toll hike, stiffer penalties against shunpikers, or the relocating of the toll gate. The record indicates that petitioning the legislature for such relief was a costly and uncertain affair (Klein and Majewski 1992, 496-98). In view of the difficult regulatory environment and apparent free-rider problem, the success of early turnpikes in raising money and improving roads was striking. The movement built new roads at rates previously unheard of in America. Table 3 gives ballpark estimates of the cumulative investment in constructing turnpikes up to 1830 in New England and the Middle Atlantic. Repair and maintenance costs are excluded. These construction investment figures are probably too low – they generally exclude, for example, tolls revenue that might have been used to finish construction – but they nevertheless indicate the ability of private initiatives to raise money in an economy in which capital was in short supply. Turnpike companies in these states raised more than $24 million by 1830, an amount equaling 6.15 percent of those states’ 1830 GDP. To put this into comparative perspective, between 1956 and 1995 all levels of government spent $330 billion (in 1996 dollars) in building the interstate highway system, a cumulative total equaling only 4.30 percent of 1996 GDP. Sources: Pennsylvania turnpike investment: Durrenberger 1931: 61); New England turnpike investment: Taylor 1934: 210-11; New York, New Jersey, and Maryland turnpike investment: Fishlow 2000, 549. Only private investment is included. State GDP data come from Bodenhorn 2000: 237. Figures for the cost of the Interstate Highway System can be found at http://www.publicpurpose.com/hwy-is$.htm. Please note that our investment figures generally do not include investment to finish roads by loans or the use of toll revenue. The table therefore underestimates investment in turnpikes. The organizational advantages of turnpike companies relative to government road not only generated more road mileage, but also higher quality roads (Taylor 1934, 334, Parks 1967, 23, 27). New York state gazetteer Horatio Spafford (1824, 125) wrote that turnpikes have been “an excellent school, in every road district, and people now work the highways to much better advantage than formerly.” Companies worked to intelligently develop roadway to achieve connective communication. The corporate form traversed town and county boundaries, so a single company could bring what would otherwise be separate segments together into a single organization. “Merchants and traders in New York sponsored pikes leading across northern New Jersey in order to tap the Delaware Valley trade which would otherwise have gone to Philadelphia” (Lane 1939, 156). Turnpike networks became highly organized systems that sought to find the most efficient way of connecting eastern cities with western markets. Decades before the Erie Canal, private individuals realized the natural opening through the Appalachians and planned a system of turnpikes connecting Albany to Syracuse and beyond. Figure 1 shows the principal routes westward from Albany. The upper route begins with the Albany & Schenectady Turnpike, connects to the Mohawk Turnpike, and then the Seneca Turnpike. The lower route begins with the First Great Western Turnpike and then branches at Cherry Valley into the Second and Third Great Western Turnpikes. Corporate papers of these companies reveal that organizers of different companies talked to each other; they were quite capable of coordinating their intentions and planning mutually beneficial activities by voluntary means. 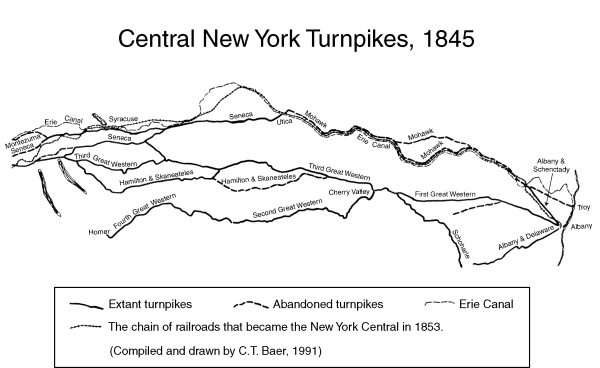 When the Erie Canal was completed in 1825 it roughly followed the alignment of the upper route and greatly reduced travel on the competing turnpikes (Baer, Klein, and Majewski 1992). Another excellent example of turnpike integration was the Pittsburgh Pike. The Pennsylvania route consisted of a combination of five turnpike companies, each of which built a road segment connecting Pittsburgh and Harrisburg, where travelers could take another series of turnpikes to Philadelphia. Completed in 1820, the Pittsburgh Pike greatly improved freighting over the rugged Allegheny Mountains. Freight rates between Philadelphia and Pittsburgh were cut in half because wagons increased their capacity, speed, and certainty (Reiser 1951, 76-77). Although the state government invested in the companies that formed the Pittsburgh Pike, records of the two companies for which we have complete investment information shows that private interests contributed 62 percent of the capital (calculated from Majewski 2000: 47-51: Reiser 1951, 76). Residents in numerous communities contributed to individual projects out of their own self interest. Their provincialism nevertheless helped create a coherent and integrated system. A comparison of the Pittsburgh Pike and the National Road demonstrated the advantages of turnpike corporations over roads financed directly from government sources. Financed by the federal government, the National Road was built between Cumberland, Maryland, and Wheeling, West Virginia, where it was then extended through the Midwest with the hopes of reaching the Mississippi River. Although it never reached the Mississippi, the Federal Government nevertheless spent $6.8 million on the project (Goodrich 1960, 54, 65). The trans-Appalachian section of the National Road competed directly against the Pittsburgh Pike. From the records of two of the five companies that formed the Pittsburgh Pike, we estimate it cost $4,805 per mile to build (Majewski 2000, 47-51, Reiser 1951, 76). The Federal government, on the other hand, spent $13,455 per mile to complete the first 200 miles of the National Road (Fishlow 2000, 549). Besides costing much less, the Pennsylvania Pike was far better in quality. The toll gates along the Pittsburgh Pike provided a steady stream of revenue for repairs. The National Road, on the other hand, depended upon intermittent government outlays for basic maintenance, and the road quickly deteriorated. One army engineer in 1832 found “the road in a shocking condition, and every rod of it will require great repair; some of it now is almost impassable” (quoted in Searight, 60). Historians have found that travelers generally preferred to take the Pittsburgh Pike rather than the National Road. By the 1840s the major turnpikes were increasingly eclipsed by the (often state-subsidized) canals and railroads. Many toll roads reverted to free public use and quickly degenerated into miles of dust, mud and wheel-carved ruts. To link to the new and more powerful modes of communication, well-maintained, short-distance highways were still needed, but because governments became overextended in poor investments in canals, taxpayers were increasingly reluctant to fund internal improvements. Private entrepreneurs found the cost of the technologically most attractive road surfacing material (macadam, a compacted covering of crushed stones) prohibitively expensive at $3,500 per mile. Thus the ongoing need for new feeder roads spurred the search for innovation, and plank roads – toll roads surfaced with wooden planks – seemed to fit the need. The plank road technique appears to have been introduced into Canada from Russia in 1840. It reached New York a few years later, after the village Salina, near Syracuse, sent civil engineer George Geddes to Toronto to investigate. After two trips Geddes (whose father, James, was an engineer for the Erie and Champlain Canals, and an enthusiastic canal advocate) was convinced of the plank roads’ feasibility and became their great booster. Plank roads, he wrote in Scientific American (Geddes 1850a), could be built at an average cost of $1,500 – although $1,900 would have been more accurate (Majewski, Baer and Klein 1994, 109, fn15). Geddes also published a pamphlet containing an influential, if overly optimistic, estimate that Toronto’s road planks had lasted eight years (Geddes 1850b). Simplicity of design made plank roads even more attractive. Road builders put down two parallel lines of timbers four or five feet apart, which formed the “foundation” of the road. They then laid, at right angles, planks that were about eight feet long and three or four inches thick. Builders used no nails or glue to secure the planks – they were secured only by their own weight – but they did build ditches on each side of the road to insure proper drainage (Klein and Majewski 1994, 42-43). No less important than plank road economics and technology were the public policy changes that accompanied plank roads. Policymakers, perhaps aware that overly restrictive charters had hamstrung the first turnpike movement, were more permissive in the plank road era. Adjusting for deflation, toll rates were higher, toll gates were separated by shorter distances, and fewer local travelers were exempted from payment of tolls. Although few today have heard of them, for a short time it seemed that plank roads might be one of the great innovations of the day. In just a few years, more than 1,000 companies built more than 10,000 miles of plank roads nationwide, including more than 3,500 miles in New York (Klein and Majewski 1994, Majewski, Baer, Klein 1993). According to one observer, plank roads, along with canals and railroads, were “the three great inscriptions graven on the earth by the hand of modern science, never to be obliterated, but to grow deeper and deeper” (Bogart 1851). Except for most of New England, plank roads were chartered throughout the United States, especially in the top lumber-producing states of the Midwest and Mid-Atlantic states, as shown in Table 4. Notes: The figure for Ohio is through 1851; Pennsylvania, New Jersey, and Maryland are through 1857. Few plank roads were incorporated after 1857. In western states, some roads were incorporated and built as plank roads, so the 1388 total is not to be taken as a total for the nation. For a complete description of the sources for this table, see Majewski, Baer, & Klein 1993: 110. New York, the leading lumber state, had both the greatest number of plank road charters (350) and the largest value of lumber production ($13,126,000 in 1849 dollars). Plank roads were especially popular in rural dairy counties, where farmers needed quick and dependable transportation to urban markets (Majewski, Baer and Klein 1993). The plank road and eastern turnpike episodes shared several features in common. Like the earlier turnpikes, investment in plank road companies came from local landowners, farmers, merchants, and professionals. Stock purchases were motivated less by the prospect of earning dividends than by the convenience and increased trade and development that the roads would bring. To many communities, plank roads held the hope of revitalization and the reversal (or slowing) of relative decline. But those hoping to attain these benefits once again were faced with a free-rider problem. Investors in plank roads, like the investors of the earlier turnpikes, were motivated often by esteem mechanisms – community allegiance and appreciation, reputational incentives, and their own conscience. Although plank roads were smooth and sturdy, faring better in rain and snow than did dirt and gravel roads, they lasted only four or five years – not the eight to twelve years that promoters had claimed. Thus, the rush of construction ended suddenly by 1853, and by 1865 most companies had either switched to dirt and gravel surfaces or abandoned their road altogether. Unlike the areas served by the earlier turnpikes and plank roads, Colorado, Nevada, and California in the 1850s and 1860s lacked the settled communities and social networks that induced participation in community enterprise and improvement. Miners and the merchants who served them knew that the mining boom would not continue indefinitely and therefore seldom planted deep roots. Nor were the large farms that later populated California ripe for civic engagement in anywhere near the degree of the small farms of the east. Society in the early years of the West was not one where town meetings, door-to-door solicitations, and newspaper campaigns were likely to rally broad support for a road project. The lack of strong communities also meant that there would be few opponents to pressure the government for toll exemptions and otherwise hamper toll road operations. These conditions ensured that toll roads would tend to be more profit-oriented than the eastern turnpikes and plank road companies. Still, it is not clear whether on the whole the toll roads of the Far West were profitable. The California toll road era began in 1850 after passage of general laws of incorporation. In 1853 new laws were passed reducing stock subscription requirements from $2,000 per mile to $300 per mile. The 1853 laws also delegated regulatory authority to the county governments. Counties were allowed “to set tolls at rates not to prevent a return of 20 percent,” but they did not interfere with the location of toll roads and usually looked favorably on the toll road companies. After passage of the 1853 laws, the number of toll road incorporations increased dramatically, peaking to nearly 40 new incorporations in 1866 alone. Companies were also created by special acts of the legislature. And sometimes they seemed to have operated without formal incorporation at all. David and Linda Beito (1998, 75, 84) show that in Nevada many entrepreneurs had built and operated toll roads – or other basic infrastructure – before there was a State of Nevada, and some operated for years without any government authority at all. All told, in the Golden State, approximately 414 toll road companies were initiated,5 resulting in at least 159 companies that successfully built and operated toll roads. Table 5 provides some rough numbers for toll roads in western states. The numbers presented there are minimums. For California and Nevada, the numbers probably only slightly underestimate the true totals; for the other states the figures are quite sketchy and might significantly underestimate true totals. Again, an abundance of testimony indicates that the private road companies were the serious road builders, in terms of quantity and quality (see the ten quotations at Klein and Yin 1996, 689-90). Sources: For California, Klein and Yin 1996: 681-82; for Nevada, Beito and Beito 1998: 74; for the other states, notes and correspondence in D. Klein’s files. Table 6 makes an attempt to justify guesses about total number of toll road companies and total toll road miles. The first three numbers in the “Incorporations” column come from Tables 2, 4, and 5. The estimates of success rates and average road length (in the third and fourth columns) are extrapolations from components that have been studied with more care. We have made these estimates conservative, in the sense of avoiding any overstatement of the extent of private road building. The ~ symbol has been used to keep the reader mindful of the fact that many of these numbers are estimates. The numbers in the right hand column have been rounded to the nearest 1000, so as to avoid any impression of accuracy. The “Other” row throws in a line to suggest a minimum to cover all the regions, periods, and road types not covered in Tables 2, 4, and 5. For example, the “Other” row would cover turnpikes in the East, South and Midwest after 1845 (Virginia’s turnpike boom came in the late 1840s and 1850s), and all turnpikes and plank roads in Indiana, whose county-based incorporation, it seems, has never been systematically researched. Ideally, not only would the numbers be more definite and complete, but there would be a weighting by years of operation. The “30,000 – 52,000 miles” should be read as a range for the sum of all the miles operated by any company at any time during the 100+ year period. Sources: Those of Tables 2, 4, and 5, plus the research files of the authors. In 1880 many toll road companies nationwide continued to operate – probably in the range of 400 to 600 companies.6 But by 1920 the private toll road was almost entirely stamped out. From Maine to California, the laws and political attitudes from around 1880 onward moved against the handling of social affairs in ways that seemed informal, inexpert and unsystematic. Progressivism represented a burgeoning of more collectivist ideologies and policy reforms. Many progressive intellectuals took inspiration from European socialist doctrines. Although the politics of restraining corporate evils had a democratic and populist aspect, the bureaucratic spirit was highly managerial and hierarchical, intending to replicate the efficiency of large corporations in the new professional and scientific administration of government (Higgs 1987, 113-116, Ekirch 1967, 171-94). [T]he ownership and operation of this road by a private corporation is contrary to public sentiment in this county, and [the] cause of good roads, which has received so much attention in this state in recent years, requires that this antiquated system should be abolished. … That public opinion throughout the state is strongly in favor of the abolition of toll roads is indicated by the fact that since the passage of the act of 1899, which permits counties to acquire these roads, the boards of supervisors of most of the counties where such roads have existed have availed themselves of its provisions and practically abolished the toll road. Given such attitudes, it was no wonder that within the U. S. Department of Agricultural, the new Office of Road Inquiry began in 1893 to gather information, conduct research, and “educate” for better roads. The new bureaucracy opposed toll roads, and the Federal Highway Act of 1916 barred the use of tolls on highways receiving federal money (Seely 1987, 15, 79). Anti-toll-road sentiment became state and national policy. Throughout the nineteenth-century, the United States was notoriously “land-rich” and “capital poor.” The viability of turnpikes shows how Americans devised institutions – in this case, toll-collecting corporations – that allowed them to invest precious capital in important public projects. What’s more, turnpikes paid little in direct dividends and stock appreciation, yet still attracted investment. Investors, of course, cared for long-term economic development, but that does not account for how turnpike organizers overcame the important public goods problem of buying turnpike stock. Esteem, social pressure, and other non-economic motivations influenced local residents to make investments that they knew would be unprofitable (at least in a direct sense) but would nevertheless help the entire community. On the other hand, the turnpike companies enjoyed the organizational clarity of stock ownership and residual returns. All companies faced the possibility of pressure from investors, who might have wanted to salvage something of their investment. Residual claimancy may have enhanced the viability of many projects, including communitarian projects undertaken primarily for use and esteem. The combining of these two ingredients – the appeal of use and esteem, and the incentives and proprietary clarity of residual returns – is today severely undermined by the modern legal bifurcation of private initiative into “not-for-profit” and “for-profit” concerns. Not-for-profit corporations can appeal to use and esteem but cannot organize themselves to earn residual returns. For-profit corporations organize themselves for residual returns but cannot very well appeal to use and esteem. As already noted, prior to modern tax law and regulation, the old American toll roads were, relative to the British turnpike trusts, more, not less, use-and-esteem oriented by virtue of being structured to pay dividends rather than interest. Like the eighteenth century British turnpike trusts, the twentieth century American governmental toll projects financed (in part) by privately purchased bonds generally failed, relative to the nineteenth century American company model, to draw on use and esteem motivations. The turnpike experience of nineteenth-century America suggests that the stock/dividend company can also be a fruitful, efficient, and socially beneficial way to make losses and go on making losses. The success of turnpikes suggests that our modern sensibility of dividing enterprises between profit and non-profit – a distinction embedded in modern tax laws and regulations – unnecessarily impoverishes the imagination of economists and other policy makers. Without such strict legal and institutional bifurcation, our own modern society might better recognize the esteem in trade and the trade in esteem. Baer, Christopher T., Daniel B. Klein, and John Majewski. “From Trunk to Branch: Toll Roads in New York, 1800-1860.” Essays in Economic and Business History XI (1993): 191-209. Beito, David T., and Linda Royster Beito. “Rival Road Builders: Private Toll Roads in Nevada, 1852-1880.” Nevada Historical Society Quarterly 41 (1998): 71- 91. Benson, Bruce. “Are Public Goods Really Common Pools? Consideration of the Evolution of Policing and Highways in England.” Economic Inquiry 32 no. 2 (1994). Bogart, W. H. “First Plank Road.” Hunt’s Merchant Magazine (1851). Brown, Richard D. “The Emergence of Voluntary Associations in Massachusetts, 1760-1830.” Journal of Voluntary Action Research (1973): 64-73. Bodenhorn, Howard. A History of Banking in Antebellum America. New York: Cambridge University Press, 2000. Cage, R. A. “The Lowden Empire: A Case Study of Wagon Roads in Northern California.” The Pacific Historian 28 (1984): 33-48. Davis, Joseph S. Essays in the Earlier History of American Corporations. Cambridge: Harvard University Press, 1917. DuBasky, Mayo. The Gist of Mencken: Quotations from America’s Critic. Metuchen, NJ: Scarecrow Press, 1990. Durrenberger, J.A. Turnpikes: A Study of the Toll Road Movement in the Middle Atlantic States and Maryland. Valdosta, GA.: Southern Stationery and Printing, 1981. Ekirch, Arthur A., Jr. The Decline of American Liberalism. New York: Atheneum, 1967. Fishlow, Albert. “Internal Transportation in the Nineteenth and Early Twentieth Centuries.” In The Cambridge Economic History of the United States, Vol. II: The Long Nineteenth Century, edited by Stanley L. Engerman and Robert E. Gallman. New York: Cambridge University Press, 2000. Geddes, George. Scientific American 5 (April 27, 1850). Geddes, George. Observations upon Plank Roads. Syracuse: L.W. Hall, 1850. Goodrich, Carter. “Public Spirit and American Improvements.” Proceedings of the American Philosophical Society, 92 (1948): 305-09. Goodrich, Carter. Government Promotion of American Canals and Railroads, 1800-1890. New York: Columbia University Press, 1960. Gunderson, Gerald. “Privatization and the Nineteenth-Century Turnpike.” Cato Journal 9 no. 1 (1989): 191-200. Higgs, Robert. Crises and Leviathan: Critical Episodes in the Growth of American Government. New York: Oxford University Press, 1987. Higgs, Robert. “Regime Uncertainty: Why the Great Depression Lasted So Long and Why Prosperity Resumed after the War.” Independent Review 1 no. 4 (1997): 561-600. Kaplan, Michael D. “The Toll Road Building Career of Otto Mears, 1881-1887.” Colorado Magazine 52 (1975): 153-70. Kirkland, Edward C. Men, Cities and Transportation: A Study in New England History, 1820-1900. Cambridge, MA. : Harvard University Press, 1948. Klein, Daniel B. and Gordon J. Fielding. “Private Toll Roads: Learning from the Nineteenth Century.” Transportation Quarterly 46, no. 3 (1992): 321-41. Klein, Daniel B. and John Majewski. “Economy, Community and Law: The Turnpike Movement in New York, 1797-1845.” Law & Society Review 26, no. 3 (1992): 469-512. Klein, Daniel B. and John Majewski. “Plank Road Fever in Antebellum America: New York State Origins.” New York History (1994): 39-65. Klein, Daniel B. and Chi Yin. “Use, Esteem, and Profit in Voluntary Provision: Toll Roads in California, 1850-1902.” Economic Inquiry (1996): 678-92. Kresge, David T. and Paul O. Roberts. Techniques of Transport Planning, Volume Two: Systems Analysis and Simulation Models. Washington DC: Brookings Institution, 1971. Lane, Wheaton J. From Indian Trail to Iron Horse: Travel and Transportation in New Jersey, 1620-1860. Princeton: Princeton University Press, 1939. Majewski, John. “The Booster Spirit and ‘Mid-Atlantic’ Distinctiveness: Shareholding in Pennsylvania Banking and Transportation Corporations, 1800 to 1840.” Manuscript, Department of History, UC Santa Barbara, 2001. Majewski, John, Christopher Baer and Daniel B. Klein. “Responding to Relative Decline: The Plank Road Boom of Antebellum New York.” Journal of Economic History 53, no. 1 (1993): 106-122. Nash, Gerald D. State Government and Economic Development: A History of Administrative Policies in California, 1849-1933. Berkeley: University of California Press (Institute of Governmental Studies), 1964. Pawson, Eric. Transport and Economy: The Turnpike Roads of Eighteenth Century Britain. London: Academic Press, 1977. Peyton, Billy Joe. “Survey and Building the [National] Road.” In The National Road, edited by Karl Raitz. Baltimore: Johns Hopkins University Press, 1996. Reiser, Catherine Elizabeth. Pittsburgh’s Commercial Development, 1800-1850. Harrisburg: Pennsylvania Historical and Museum Commission, 1951. Ridgway, Arthur. “The Mission of Colorado Toll Roads.” Colorado Magazine 9 (1932): 161-169. Roth, Gabriel. Roads in a Market Economy. Aldershot, England: Avebury Technical, 1996. Searight, Thomas B. The Old Pike: A History of the National Road. Uniontown, PA: Thomas Searight, 1894. Seely, Bruce E. Building the American Highway System: Engineers as Policy Makers. Philadelphia: Temple University Press, 1987. Thwaites, Reuben Gold. Early Western Travels, 1746-1846. Cleveland: A. H. Clark, 1907. U. S. Agency for International Development. “A History of Foreign Assistance.” On the U.S. A.I.D. Website. Posted April 3, 2002. Accessed January 20, 2003. Wood, Frederick J. The Turnpikes of New England and Evolution of the Same through England, Virginia, and Maryland. Boston: Marshall Jones, 1919. 1 Daniel Klein, Department of Economics, Santa Clara University, Santa Clara, CA, 95053, and Ratio Institute, Stockholm, Sweden; Email: Dklein@scu.edu. John Majewski, Department of History, University of California, Santa Barbara, 93106; Email: Majewski@history.ucsb.edu. 3 For a discussion of returns and expectations, see Klein 1990: 791-95. 4 See Klein 1990: 803-808, Klein and Majewski 1994: 56-61. 5 The 414 figure consists of 222 companies organized under the general law, 102 charted by the legislature, and 90 companies that we learned of by county records, local histories, and various other sources. 6 Durrenberger (1931: 164) notes that in 1911 there were 108 turnpikes operating in Pennsylvania alone.